Clonex Rooting Gel is EPA registered and is approved for use on all plants, including food crops, in all 50 states plus Washington DC and Puerto Rico. The new name “Clonex Rooting Gel” replaces the old name “Clonex Rooting Compound.” There has been no change in the gel itself – only the name has been changed to distinguish between the new EPA Registered Clonex and the older non-registered version. Because of the EPA registration we are required to include a lot of new information on the label, mostly in the fold-out section. In case your customers ask, this is standard information that is required for all EPA registered products. The important thing to remember is that there has been no change in the formulation of Clonex. The new product is exactly the same as the old product. Growth Technology recently initiated a series of laboratory trials to support registrations in Europe and the consistently positive results were amazing. We have enduring confidence in the formulation. Brochures announcing this change, along with other pertinent information regarding Clonex, have been sent out nationwide to retailers and distributors. Contact your HDI Sales Representative with questions regarding the Clonex announcement, or email us at info@hydrodynamicsintl.com. You can also reference the nationally distributed brochure here. 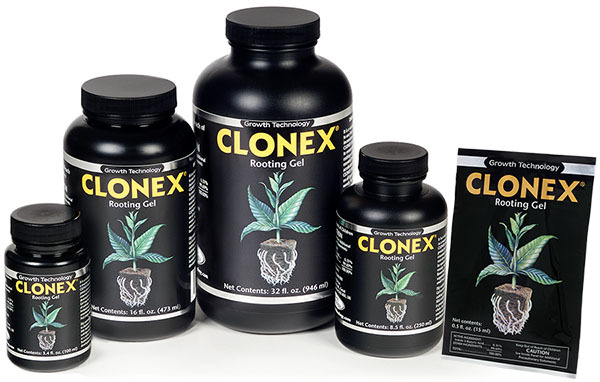 Clonex Rooting Gel is used for the successful propagation of plant cuttings. Simply dip the cut end of the plant cutting into Clonex Rooting Gel and immediately stick the cutting into a plant starter cube. We recommend Root Riot Starter Cubes. Full instructions for taking a plant cutting can be found in the Clonex Propagation System guide. Clonex Rooting Gel has been providing explosive root development for serious growers and plant nurseries since 1988. It’s available both online and at hydroponic stores across the U.S.